CARMEL, Calif. – July 19, 2017 – Charles Maher, an award-winning painter and 21 year member of the Automotive Fine Arts Society (AFAS) will debut two new original paintings celebrating the legendary Juan Fangio and “Bentley Boys” at the group’s exhibit during the Pebble Beach Concours d’Elegance on Aug. 20, 2017, from 9:00 a.m. to 4:30 p.m., in Carmel, California. This is the 22nd year that Lincoln Motor Company will sponsor the AFAS exhibit on the Pebble Beach show field. Maher is renowned for pushing the boundaries of creativity and exploring new subjects. The acrylic on canvas piece is comprised of four major elements and 13 smaller ones, the “Bentley Boys” pays homage to the pair of early adventurers, Sir Henry Stanley “Time” Birkin and Woolf Barnato. Titled “Composition in Green and Gold”, Maher’s 45-inch by 120-inch painting features the two early sportsmen dressed handsomely next to a 1928 Blower Bentley 4.5L. The British Racing G racecar is prominently placed in the foreground and juxtaposed by an explosion of complementary yellows and oranges. 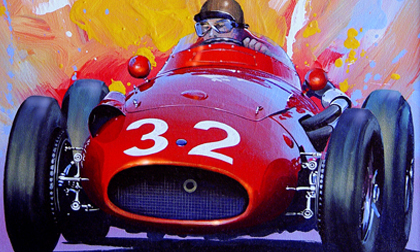 Maher’s second featured painting for this year’s Pebble Beach Concours d’Elegance features the World Champion Argentinean Formula One driver, Juan Fangio, behind the wheel of a hot rod red Maserati 250F. Maher grew up in Miami, Florida. Destined to work with cars, he began his automotive journey at the wheel of his family’s 1955 Chevy Bel-Air. He earned a bachelor’s degree in Fine Art from the University of Notre Dame in 1968. After working as a designer for Ford Motor Company, Maher spent 14 years with a graphics firm in Detroit designing production car graphics for Ford, GM, Honda and Toyota. He also completed projects such as pace car graphics for Indianapolis and the Long Beach Grand Prix. Maher’s work has been displayed at Concours d’Elegance events at Amelia Island, Ault Park, Greenwich, Meadow Brook, The Inn at St. Johns, Pebble Beach and the Eyes-on-Design Exhibition in Grosse Pointe, Michigan. His artwork has appeared in AutoWeek, Automobile, Car Collector, Mustang Monthly, Racer, Road & Track, Automobile Quarterly, and Sports Car Market magazines. For more information about Charles Maher’s art, visit his website. First conducted in 1950, Pebble Beach Concours d’Elegance® (www.pebblebeachconcours.net) has grown to be the world’s premier celebration of the automobile. Only the most beautiful and rare cars are invited to appear on the famed 18th fairway of Pebble Beach Golf Links®, and connoisseurs of art and style gather to admire these masterpieces. Charitable donations raised by Pebble Beach Concours d’Elegance® now total over $17 million. Related events include Pebble Beach Tour d’Elegance™ presented by Rolex, Pebble Beach RetroAuto™, and Pebble Beach® Auctions presented by Gooding & Company. Pebble Beach®, Pebble Beach Golf Links®, Pebble Beach Concours d’Elegance®, Pebble Beach Tour d’Elegance™, Pebble Beach RetroAuto™ and Pebble Beach® Automotive Week are trademarks, service marks and trade dress of Pebble Beach Company. All rights reserved.